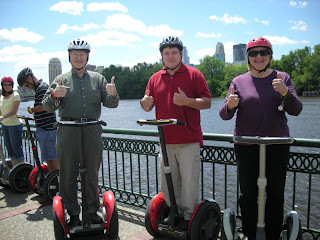 It was another nice June day in Minneapolis so Linda, Terry and I headed over to Mobile Entertainment in St. Anthony Main for a Segway tour of Minneapolis. 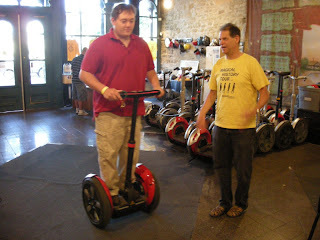 Terry was first up on his machine and here he gets some pointers from our tour guide, Gary. It's easy to catch on to the machine. We headed out on the tour following Gary, single-file on a three hour tour. The tour started out taking us across the Stone Arch Bridge with a great view of St. Anthony Falls. From there we passed by the Mill City Museum, Mill Ruins Park and Gold Medal Park. 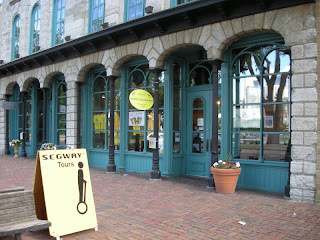 This is billed as a "Magical History Tour" but it also reminds you of touring the State Fair. We took a midpoint break at the Guthrie Theater. The rest of the tour took us along the west bank of the river up to the Plymouth Avenue Bridge. Minneapolis has done a great job making the riverfront accessible since the years when Linda and I worked downtown. The tour took us through boom island and Nicollet Island before coming back to St Anthony Main. We gave it a unanimous "two thumbs up!" 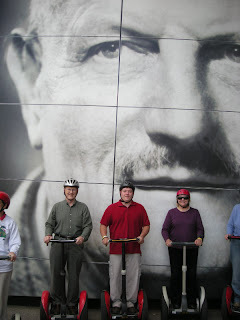 By this time we were pretty good Segway drivers. 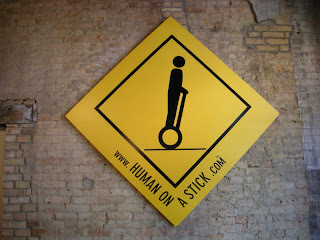 Gary had us pilot the machines right through the front door of the shop and back into their parking spots. 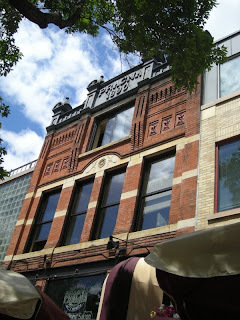 The tour price of $70 includes a 25 % discount for several nearby restaurants so ended the day at Pracnas on Main.